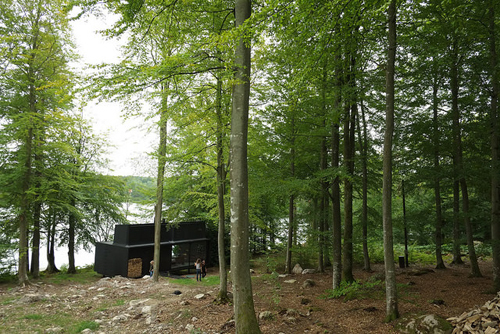 The VIPP Shelter is a compact summerhouse located at Sjön Immeln (Immeln Lake) near Immeln in Skåne, the south of Sweden. 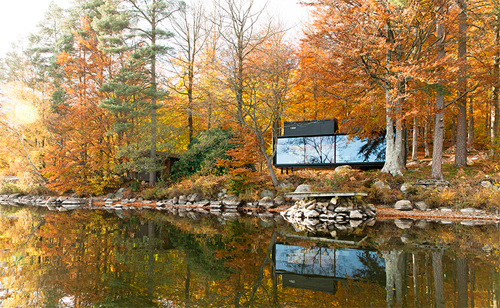 The Vipp Company has made a plug and play getaway that allows you to escape urban chaos in a 55 m2 all-inclusive nature retreat. 75 years of experience with steel processing is used to craft this prefabricated object designed down to last detail. 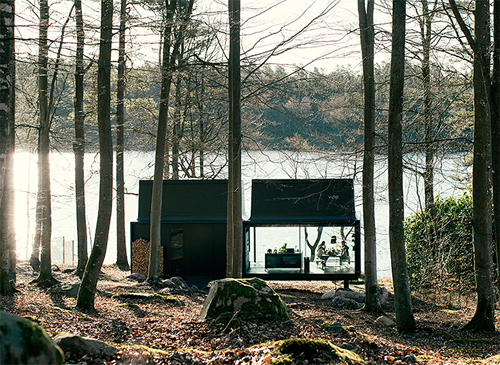 A simple steel grid structurally supports the two level space, where only the bathroom and bed loft is shielded from the main living space. Within the transparent shell, nature is omnipresent yet with a physical blindage that provides shelter. The shelter is a finished product inspired by large volume objects such as planes, ferries and submarines, where every single screw serves a purpose. 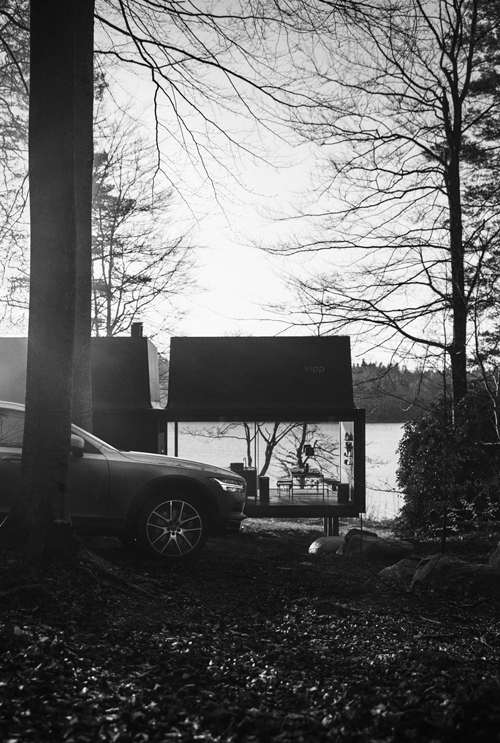 The driving ambition behind the Vipp shelter was the opportunity to match your kitchen and its accessories to your nature retreat. The result is a plug & play getaway, fully equipped. 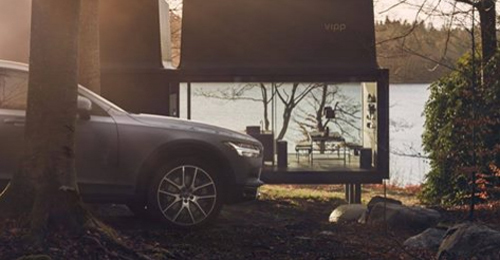 Morten Bo Jensen, Chief Designer at Vipp, is the creative force behind Vipp’s biggest product to date. Here, he unveils how and why Vipp’s design philosophy can translate into a product family ranging from a bin to a shelter. 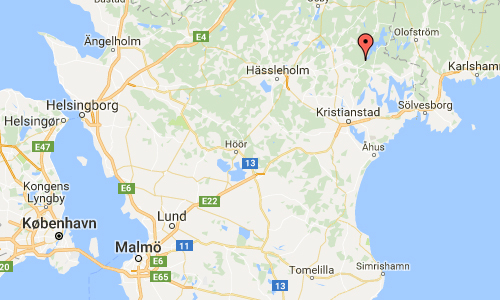 Sjön Immeln is a lake in the municipality of Kristianstad, olofström municipality, Osby and Östra Göinge Municipality in Skåne. The lake is 28 meters deep, has an area of 22.4 square kilometers and is 81.1 meters above sea level. The lake is drained by the river Skräbeån (Alltidhultsån). At Immeln are the communities Immeln, Breanäs, Mjönäs. It is Skånes third largest lake. The lake has its outlet through Edre river in the northeast and there is a dam where the runoff can be controlled. The lake is mentioned in the literature by including Harry Martinson. 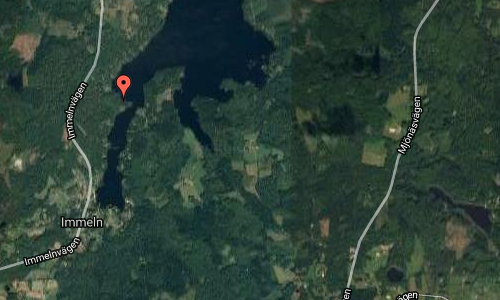 There is a Canoo trail through the lake which contineus to the lakes Filkesjön, Raslången and Halen. Renting a canoo is possible in Immeln, Botorpet and in Olofström. 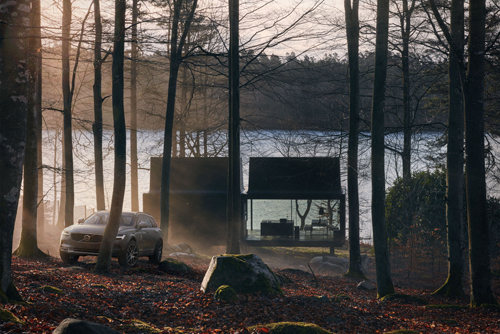 In Olofström you will find a factory of Volvo Cars. Volvo Cars body components plant at Olofström was officially founded in 1735. September 24, 2010 it celebrates its 275th anniversary. More information at sv.wikipedia.org, www.ignant.com and www.vipp.com.